CONQUER THE MOUNTAIN IN GOLDEN TONES AND GLAMOROUS METALLICS. Iconic Style for the Modern Age. Our original inspiration for the Rock and Gold editorial was a color palette of ivory, gold and champagne. The silhouettes of the Alexander McQueen’s Spring 2016 Ready to Wear runway show were on our mood board along with super model of the 70’s: Veruschka. 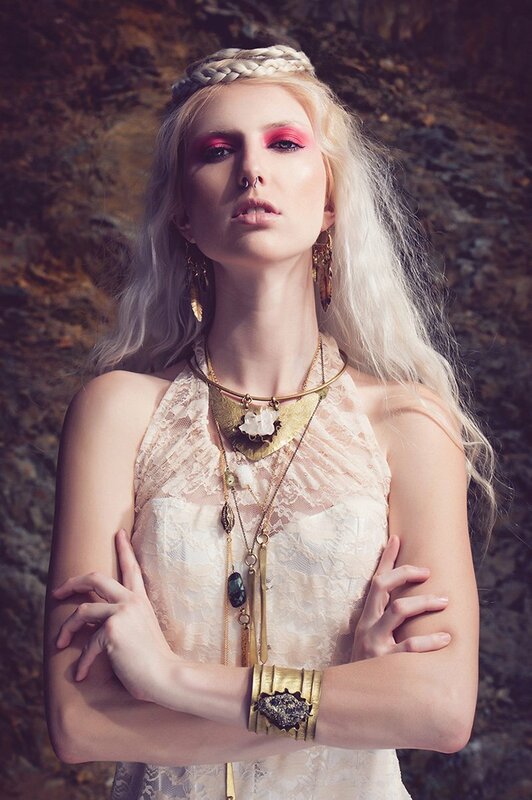 We paired soft textures of lace, ruffles, lingerie and tulle with the hard lines of the bold handmade jewelry collection by Ursula Guderian to create the story of the warrior princess. To offset the dominant neutrals of our location and garments I incorporated pops of fiery reds in the makeup and accessories. Red is a power color, perfect for our fearless model Rose Lynch, who captured the essence of our sun-kissed goddess perfectly. Safari Chic is a style that incorporates military elements with tribal vibes and earthy tones. The muted beiges give it an edge and the feeling of androgyny. Leather accessories and metallic jewelry make it very luxurious. It’s so iconic, when done right, and looks timeless. Perfect for the summer season. The Warrior Princess aesthetic feels young and rebellious while incorporating elements of the past. Perfect for the modern woman who loves romantic lines and colors but doesn’t need rescuing. All royalty must demonstrate status with a collection of amazing treasure, so incorporating statement jewelry is a must.